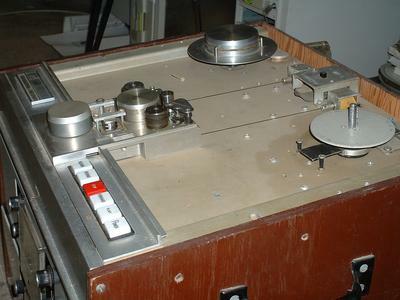 These Dynatrack-only machines used two tape tracks to record each audio channel. One track of the pair was a normal NAB-standards track, but the other track had high frequency preemphasis to overcome tape hiss. 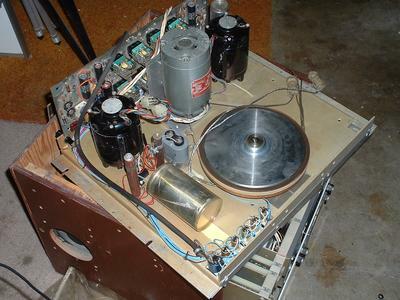 The "intelligent" playback system selected the correct track to optimize noise and distortion, taking advantage of the fact that the tape hiss was masked by the audio program at high signal levels. The trasitions between tracks was totally undetectable. The transport provided greatly reduced flutter, especially in the scrape flutter range of 2K-5KHz. After a few prototypes were constructed, 3M ran a pilot run of 6 machines. These machines were manufactured in St. Paul, which is where the Audio Lab with Jack Mullin, Ken Clunis, Don Kahn and Ray Smith was located. A 3/4" 3-channel 6-track delivered in Los Angeles to Leo Hulseman of the Solo Cup Company 4/23/65 after the LA AES Convention. In addition, there were a few prototypes. One was donated to the Music Department at New Mexico State University. The Audio Lab test unit was given to me by Jack Mullin. There was also a Demo Unit in portable cases - location unknown. I believe the NARAS Museum has one of the Capitol Records machines in their collection. These machines had no provisions for an erase head or SelSync. They were strictly intended for master recording. The M23 grew out of this project, but the M23 was primarily an NAB one-track-per-channel with SelSync and erase, but convertable to Dynatrack. The Stockholm machine probably saw the longest use, recording the Stockholm Symphony. As an interesting side note, Leo Hulseman's studio technician was John Stephens, who later modified 3M decks with his own electronics and eventually designed his own capstanless transport. Aside from needing two tracks per channel, the system was well beyond any other tape recording system at the time. Eventually, the Dolby system overtook Dynatrack because it didn't require 2 tracks per channel. The M23 8-track configured for 8 NAB channels became a big player in the multitrack/overdub environement of the late '60's.